Traditional braces and Invisalign are two of the most common techniques used by dental professionals to straighten the teeth of their patients. The main purpose for such treatment options is to help move teeth to their ideal position, improving their patient’s look. At the same time, both treatment options also promote proper function of the teeth, which helps prevent further dental problems in the future. With traditional braces, dentists use metal wires, brackets and even elastics to help “push” teeth to their ideal position. Meanwhile, Invisalign utilizes a set of clear plastic trays to accomplish the same thing. The main difference between the two is that traditional braces are very obvious and have been known to make patients feel self-conscious about their smile. While, on the other hand, Invisalign remains practically invisible. Each treatment option presents its own set of advantages and disadvantages. It’s important that you know what each treatment option brings to the table in order to make a proper, informed decision about which treatment you’ll choose to help improve your teeth. 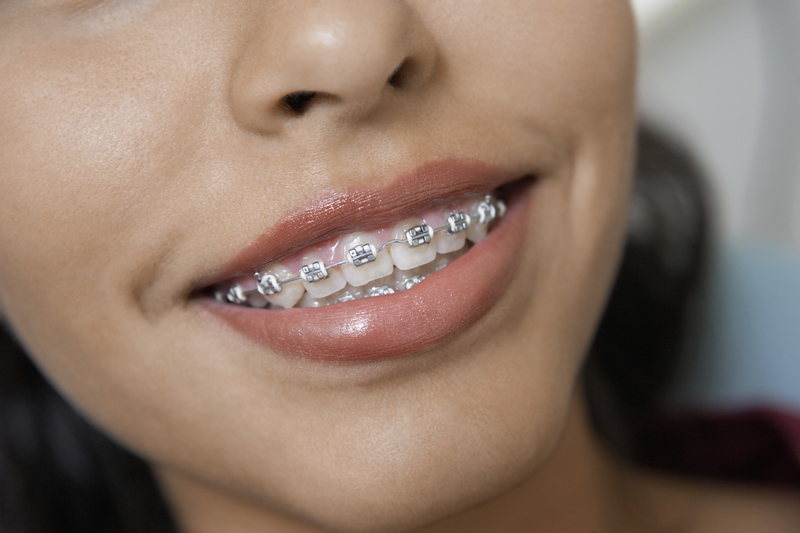 Traditional braces work by utilizing wire and brackets that pressed against your teeth, encouraging slight movements of the teeth that gradually helps put it in proper alignment and eventually, straighten it. Dental braces are considered the more versatile of the two as the procedure can be used to correct even the most complicated cases. While it is debatable about whether the braces are esthetically pleasing or not, what can’t be denied is its function and how effective braces are in straightening teeth. The use of visible brackets and wires can make the patient feel self-conscious about their smile. While, the patient can learn to adjust to this over time, it still is a major deciding factor that’s worthy of consideration. Braces are permanent and can only be removed by an orthodontist. Also, should any of the wires or brackets be lost, they’d have to be refitted by the orthodontist and additional costs may be incurred. The patient will have to adjust to a whole new oral routine, mainly because braces require more extensive care, including different brushing and flossing techniques for proper cleaning. The risk of breaking and staining means that the patient will have to alter their diet and avoid certain food items. Invisalign utilizes a set of clear, computer-generated trays that has to be worn for around 20 to 24 hours a day, only to be removed when eating or drinking. The tray is also changed every two weeks, though certain trays can last for as long as six months and even one year in between changes. The best advantage to using Invisalign is that they’re practically invisible, hence the name. This is good news for those who simply do not want people to know that they’re wearing braces. This also helps avoid being put in awkward social situations where the braces may end up being the source of discrimination or bullying. While Invisalign is mainly considered as an esthetic procedure, it works almost as effectively as dental braces do and, in many cases, improving the functionality of teeth. That and the fact that Invisalign does not cause any speech problems and can easily be removed anytime makes Invisalign a generally more appealing option. The unique advantages that Invisalign offers – such as being able to take them out anytime, no need for dietary changes and so on – clearly makes it the better treatment option of the two. Ultimately though, your orthodontist will be the most qualified person to help you weigh out which of the two are best suited for your particular case. Be sure to discuss with your orthodontist thoroughly to make sure that you do not make a choice that you’ll end up regretting in the end.